See if we have better workers comp rates for your tow truck service. Learn more about our Tow Truck Workers Comp Insurance Programs. Workers compensation for your towing business can be hard to find and pretty expensive to purchase. Depending on your hours of operation and state, it may be impossible to get coverage outside your insurance State Fund. However, we're working hard to create better workers compensation solutions for towing companies in most states across the U.S. Call us today to see if we can help your towing business. 7228 Local Towing. This is the same class code used for local hauling with tractor trailers. It applies to most tow truck operators who travel less than 200 miles from their home base to provide towing related services. This class also includes automobile haulaway and automobile repossession operations when performed for banks and automotive sales agencies. 7229 Long Distance Towing. Companies who perform towing of automobiles, trucks, or tractors over 200 miles away from their primary location or residence should utilize this classification code. Includes flatbed towing and repossession services greater than 200 miles. NOTES Underwriters evaluate and price tow truck companies on many factors besides the class codes. Towing companies who travel smaller areas, don't provide 24-hour services, and don't do repossession typically get better pricing and more quote options. 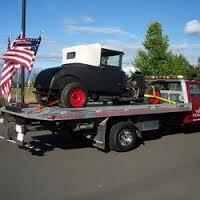 Call us for more details about our towing programs. Applied Underwriters currently offers short haul programs for towing, dump trucks and delivery under 200 miles. AmeriSafe has a long-haul towing program and offers very competitive workers compensation rates. UBIC continues to expand into more states and offers better rates on all towing and trucking risks. MEM provides exception safety services and is actively quoting many towing operations. Applied Underwriters offer a high deductible plan and 3 year rate guarantee for larger trucking risks. Available in select states. NBIS provides quotes for car hauling and trailer movers. We offer other quote options and lines of coverage from some of our other insurance companies depending on your state, nature of business, and claims experience. Give us a call today to learn more about our towing programs. And to see if your business qualifies for lower cost coverage on workmans comp. Not a lot of insurance agencies have access to markets that offer workers compensation coverage for towing operations and tow truck companies. We offer exclusive towing programs with lower class code rates so you get the best deal on coverage.